The Wauwatosa School District (WSD) serves students and families in the city of Wauwatosa, Wisconsin. Located in the metropolitan area of Milwaukee, the city is known for its vibrant and diverse community, thriving shopping and business districts, and convenient location in southeastern Wisconsin. The school district consists of 15 schools that offer a quality education that prepares students, promotes diversity, and builds community relationships. 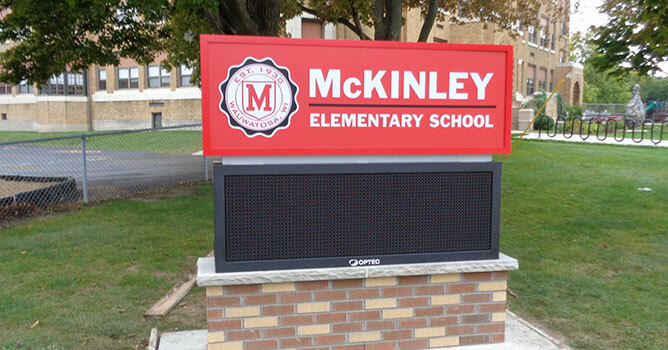 District officials recognized aging school signage throughout the community and committed to replacing the signs with integrated Electronic Message Centers (EMCs), a solution that would assist with communication efforts as well as brand the district. However, the cost of the signs needed to be worked into the district’s limited annual budget. As the schools began fundraising for the new signage, the district facilities director chose Lemberg, with its 90-year local history and reputation for reliability, to find a sign solution that gave the district the most number of signs in the shortest time frame. Lemberg’s sign and lighting division set out to achieve the Wauwatosa School District’s goal of finding a consistent, cost effective design that could be customized for each school location. They worked with the district facilities director to design monument signage with integrated, full-color EMCs that were two-feet tall and could handle four lines of copy. Most importantly, the team worked with EMC and materials vendors on quantity discounts for an overall sign package that would serve all 15 schools and be implemented over the course of several years at a rate of two schools per year. Design continuity was important for district branding. The EMC units were chosen based on ease-of-use and cost efficiencies. Despite the challenge of different location requirements, Lemberg’s sign design team kept all design elements similar, offering the best from partners on multi-site discounts. The header panels for the monument signs were customized with the colors and mascot of each school. The brick bases were crafted from the same masonry as was used in the onsite buildings. Lemberg’s own electrical service division, masonry and foundation partners, and the EMC manufacturer representatives worked together to create a turnkey experience for the WSD. The ability to have Lemberg as a local service provider was attractive to the district decision-makers, especially since the Lemberg’s team members can easily attend district and school planning meetings where necessary to the implementation of a new sign. The integrated technology of the EMC is becoming a standard style in signage for many school grounds today. Messaging is easy to change and can be programmed well in advance. For Wauwatosa School District, the newly branded, integrated EMC signs welcome students at the two Wauwatosa High Schools, Whitman and Longfellow Middle Schools, and McKinley and Wilson Elementary Schools. Schools in the district with the EMC signs have given positive feedback, citing easy-to-learn software and accessible local support. Clear, esthetic and consistently branded, these signs offer a layer of communication with students, families, staff, and neighbors that supports website and backpack communications with unprecedented convenience. a new sign and electronic message center. 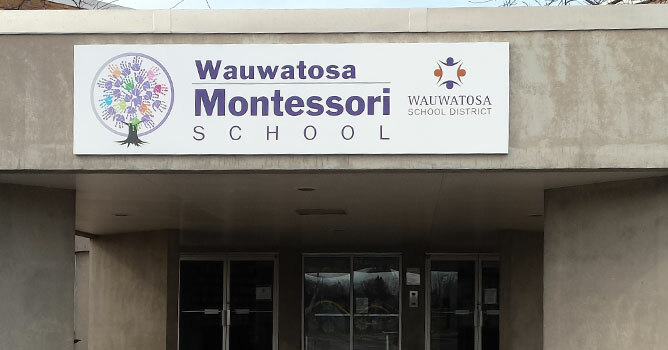 Wauwatosa School District outfitted their Montessori School with colorful identifying signage at various entrances. 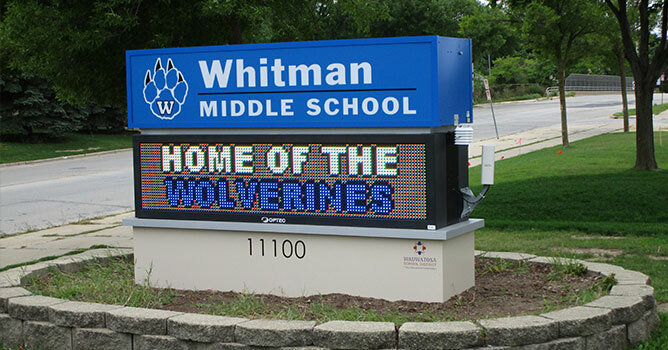 Wauwatosa's Whitman Middle School has a new sign and electronic message center to inform their community.